A blog for skiers and riders with a special focus for enjoying the mountain experience as a family. If you've seen the movie "Stranger than Fiction" you'll know about people becoming obsessed with numbers. Here's a clip from the beginning of the film, which tees up the topic for today's post. So what's the connection? 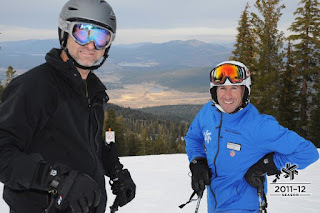 Northstar's new EpicMix system has been tracking tons of numbers, and has me and some of my ski-school friends constantly comparing stats. Now the numbers you're probably most interested in relate to what we're skiing on. With Mother Nature being a bit stingy with her natural snow, I'm happy to report that Northstar's Snowmaking and Grooming Team are the bomb! The corduroy has been awesome in the morning, and the only reason I'm typing rather than skiing on my day off is that one of my students passed on a number of germs. I don't know the stats, but I'm recording my first cold of the season. That's all the numbers I can think of to share today, but since I'm home sick, feel free to call me at 415-601-1325 if you want to talk skiing! Dressing children for skiing or boarding - Warm and dry equals fun! It's not too late to get in shape for your ski season! What do ski instructors know about stress? This Mountain Life is like the living room of a ski chalet. We've got a warm fire burning, there's hot chocolate and pasta being made in the kitchen, and everybody's talking about how much fun we had on the slopes, or asking how we can have more fun tomorrow. The folks who visit these pages are primarily families and individuals I ski or snowboard with in the winters. This Mountain Life 2010/2011. Powered by Blogger.